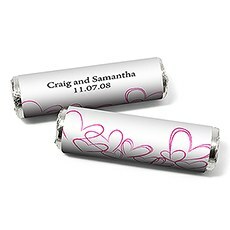 Customized candy roll wrappers from Wedsy make the party favours from a trendy candy bar or buffet more memorable. Read on to take your event to the next level! Letting your guests help themselves at a fun, colorful candy bar or buffet is a very on-trend way to spark conversations and make any event memorable, from casual family reunions featuring nostalgic treats to formal weddings with a sophisticated black-tie theme. 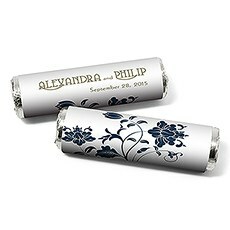 Take the candy buffet to the next level by including customized candy roll wrappers that add a personal message to the mints, caramels or other rolled candy you already love. 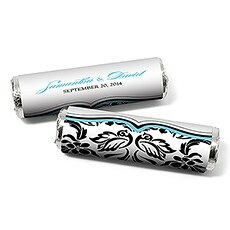 Our high-quality wrappers come in a variety of colors and themes to complement the other decor at your event and add a meaningful message your guests can take home and cherish. 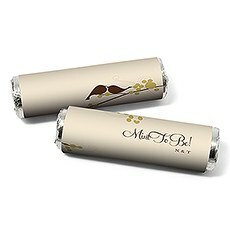 The Love Bird candy roll wrapper will add a sweet whimsical touch to any wedding or anniversary party. Choose from four stylish colors, then add two lines of text to toast the happy couple or thank your loved ones for supporting you all these years. 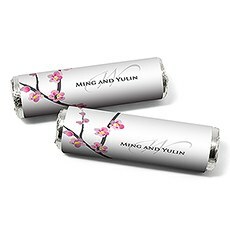 For a festive finishing touch that brings a bit of your personality to your candy bar or buffet, include your favorite rolled mints or candies in our unique Expressions personalized candy wrappers. 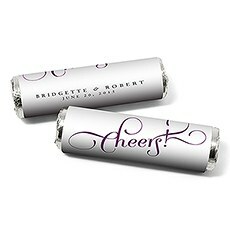 A joyful message of "Cheers" or "Enjoy" with your names and the date of the special day will ensure your guests know you were thinking of them when you were choosing your favorite treats to share with them. And they'll love having a memento with such a sweet sentiment. 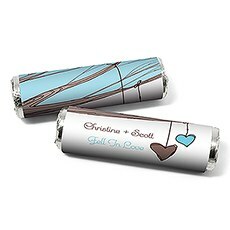 Foil-wrapped candies are not included, so some assembly will be necessary, but our custom-printed wrappers fit most 22-ounce candy rolls, and most North American orders over $99 ship free.